I have a HUGE sweet tooth that began when I started baking pies for the 4-H Club, when I was 12 years old! Over time, as I got older and began to work with a lot of children, I learned how to make healthy snacks that are not only delicious and satisfying, but also fun! This week as I was rummaging through my cabinets for something sweet, I had a few ingredients and decided to make some healthy, tasty snacks. As I shaped the dough into a shape like a cookie, I came up with the perfect name and song to get kids involved and excited to eat this delicious snack, called “The Patty Cake Snack”. Preheat toaster oven at 350 degrees. Process the almond butter and date in a food processor or mini chopper, until well mixed. Add almond butter and date spread to a small bowl and stir in the remaining ingredients. Roll 1 tablespoon of the mixed dough into a ball using your hands. 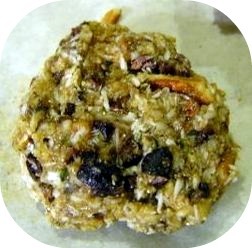 If the dough is not stiff enough to roll into a ball, add more ground flaxseeds until stiff. Flatten the ball of dough with hands and shape into a small circle. Continue until all the dough has been used. Bake in a toaster oven about 3 to 5 minutes. Have your child sing this song as they’re making their healthy snacks! Patty cake, patty cake….clap, clap, clap! Patty cake, patty cake…it’s good for me! You can even freeze the dough and bake when desired. This recipe is also delicious as a frozen treat! Rhonda is a cookbook author who recently published her first book, So, What Can I Eat Now?! Living Without Dairy, Soy, Eggs, or Wheat. To learn more about the cookbook or purchase a copy, please visit http://www.rhondascooking.com. I’m so happy I read this before I took off for the grocery store! They look so good. Thanks Rhonda! These are right up my alley. I love that they are healthy and will satisfy my sweet tooth. Hi, All, I’m so glad that you liked it. I just made them tonight for me!! Not too sweet…hit the spot just right!